Best listening experience is on Chrome, Firefox or Safari. Subscribe to Federal Drive’s daily audio interviews on Apple Podcasts or PodcastOne. One reason the United States cotton industry is competitive worldwide is the work of a distinguished and long-serving scientist — and his team — at the Agriculture Research Service. 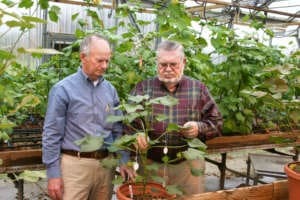 Johnie Jenkins, right, is a scientist at the Agricultural Research Service. Johnie Jenkins has worked for ARS — an organization within the Agriculture Department — for almost 58 years. Jenkins, a supervisory research geneticist, is a winner of one of the 2018 Presidential Rank Awards in the category of distinguished professional. Even as a member of the federal service, Jenkins has a lot of interaction with the every day farmers and producers. He said his career wouldn’t be the same without other people. In the Dec. 10 interview, he told Federal News Network he was proud of his published manuscripts, many with over 200 signets. He’s also trained at least 75 graduates that have gone on to make major contributions in the agriculture sector. Jenkins is a credited member of the team able to get rid of a particular pest that made growing cotton a nightmare. This wasn’t done through the use of poison however, but certain genetic engineering techniques. The project began in a laboratory in 1961. Over the next decade, they were able to develop 10 to 12 different genetic techniques. Through pilot testing, the team developed a method used to alleviate the problem for good in most places: Pheromone traps. Boll weevils are native to central Mexico. Jenkins said his team still has to monitor areas around the Rio Grande Valley of Texas. He also worked with his team at USDA, members of the biotech industry and the Environmental Protection Agency, to help test and develop strains of cotton resistant to certain pests, insects and nematodes (microscopic worms, insects). He said what science is able to achieve now is what they were dreaming of when he was in graduate school. Much of USDA and ARS’ success in this area is due to those advances in genomics. He said it was a major breakthrough for even the commercial industry. Jenkins was inducted into the ARS USDA Science Hall of Fame in 2007 for his work developing pest-resistance strains and plant-mapping techniques. This is not his first Presidential Rank Award either. In 2008, he received the Award of Meritorious Executive for his plant-mapping work. When asked about retirement, Jenkins shrugged it off. Steff Thomas is a digital editor at Federal News Network.